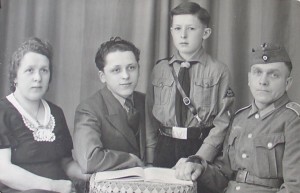 Eberhard Wendler was conscripted into the German army in January 1944, at the age of 17. His unit was in combat against American forces in Normandy shortly after D-day, and he was taken prisoner on 26 July. He finished up at High Garrett prisoner of war camp near Braintree, Essex, where he kept a journal about everyday life as a POW in Britain. 5th January: it snowed here for the first time. In this weather, with the ground frozen hard, we had to cut sugar beet. In the evening I bought [from the camp shop] two handkerchiefs for eight-pence. 6th January: at 2100 hours two V-2 rockets exploded near our camp with a terrifying din. Over the coming weeks, I’ll be posting more of Eberhard’s diary entries 70 years (to the day, in many cases) after they were written, leading up to the end of the war with Germany in May 1945.